BREA, California, May 2, 2018 /PRNewswire/ — Beckman Coulter announced today the release of the DxH 900 hematology analyzer, giving mid- to high-volume clinical laboratories the ability to perform complete blood count and white blood cell differential tests with minimal repeats. The DxH 900 is now available for sale in Europe, the United States, Canada, Australia and New Zealand. The DxH 900 analyzer offers advanced technologies to support patient care, by delivering the right results the first time. Foundational to the system are its core technologies, including the enhanced Coulter Principle, VCS 360 and DataFusion. These features offer high-resolution analysis of cells in their near-native states, providing a precise cellular assessment for excellent red blood cell, platelet and white blood cell test results on the first pass. "The DxH 900 hematology analyzer is an example of our commitment to the voice of the customer. We had over 100 of our customers view prototypes, and we enhanced our designs based on their input. Truly, the DxH 900 was designed by customers for customers," said Peter Soltani, Ph.D., senior vice president and general manager of the hematology business at Beckman Coulter. "The suite of technologies is intended to help laboratories deliver quality results for fast, accurate clinical decision-making. At the same time, the system includes automated solutions that streamline the number of procedural steps needed to produce those results, offering predictable performance and greater laboratory efficiency." The DxH 900 analyzer demonstrates industry-leading 93% first-pass throughput,1 providing accurate flagging and reducing the number of slide reviews. This helps to generate reportable results as quickly as possible, reducing the time, supplies and costs that may be required for systems with higher repeat rates. Adding to this is the analyzer’s lean reagent portfolio, which includes four reagents compared to 11 reagents required by other analyzers.2 Further, the DxH 900 features one of the smallest footprints in its class, making it highly efficient in utilization of laboratory space. Many of the parameters available with the DxH 900 analyzer are designed to directly impact patient care by addressing critical conditions, such as thrombocytopenia, anemia and leukopenia. Sepsis, is another often-deadly condition that affects millions of people worldwide each year. A recognized global healthcare concern, sepsis puts patients in grave danger and places a significant burden on the healthcare system as a whole. Beckman Coulter is evaluating a hematology sepsis* parameter that is part of a routinely ordered test in the emergency department, where earlier recognition and treatment of sepsis can begin. This test can be performed on the DxH 900 analyzer. 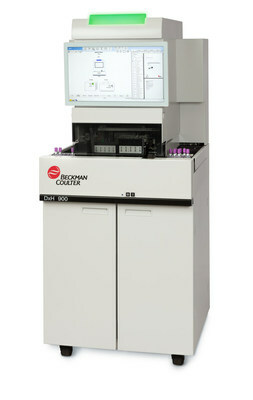 The DxH 900 hematology analyzer complements the recently announced DxH 520* system, and further expands Beckman Coulter’s hematology portfolio. These solutions provide a high level of continuity of care for clinical laboratories, regardless of whether they are small- or high-volume facilities. Beckman Coulter Diagnostics helps healthcare and laboratory professionals provide better patient care by delivering the accurate diagnostic information they need, when they need it. For over 80 years, Beckman Coulter has been the partner of choice for healthcare organizations. Our scalable instruments, comprehensive diagnostic tests and business management services are trusted by hospitals, laboratories and other critical care settings around the world. We share in our customers’ mission toward continuous improvement and quality patient care because we believe when efficiency and clinical outcomes are improved, patients benefit and we can move healthcare forward for every person. DxH series side-by-side results documentation. Automated hematology analyzer manufacturers’ Instructions for Use (IFUs). Disclaimer: The Early Sepsis Indicator is not available in all countries. * CE Marked and is pending 510(k) clearance by the U.S. FDA. Not yet available for in vitro diagnostic use in the U.S.